Oasis can handle any business window cleaning your company has. We are professionals who respond in a timely manner and get the job done. It's no wonder our customers rave about us. 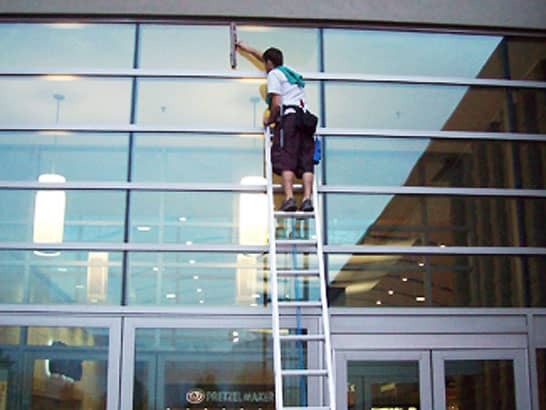 We come to your business and you may not even know we are there cleaning your windows. At the end of the day your business will have clean windows when you are done working. We call that the " Nice Feeling". It's up to you when we clean your windows. You can have them done once a week, twice a month or whenever you feel they are dirty. This is the best thing about working with Oasis. You are the boss and are incomplete control. We completely understand having clean windows is a necessity and we also understand not every company can pay right away when the job is done. This is another benefit of working with Oasis. We send you an invoice when the job is done and you can take 30 days to pay us if you choose. Sure, we like to get paid but, this gives you the freedom to get other things out of the way first. Very little in life is guaranteed, so with Oasis window cleaning we guarantee our work. If for any reason you are not satisfied with our work, just give us a call and someone will come back out right away. We don't usually have this problem but things can happen. And we respond right away and take our customers very seriously. We know you have questions about your business window cleaning and we are here to help. Just call us and we will gladly answer any and all questions on the phone. And if you want someone to come out to your business for a quote or have us answer more question, no problem. We are very flexible. Oasis business window cleaning services will take care of the dirt, so you don't have to. Window cleaning is a job no one likes to do. But, we love it and are good at it. You will see!